There are thousands of TGP sites on the internet, but only a small fraction control the majority of the TGP traffic. After you create a TGP gallery, don’t think you have to submit to every TGP you find, instead concentrate on the larger sites to maximize your time/money ratio. There’s a big hurdle though. Because of cheaters who would redirect their galleries after getting listed to dialers, trojans, pop up hells, spyware and worse, to make a quick buck, many TGP sites have moved to partner accounts (PAs) to get listed. You have to fill out an application and the TGP site owner checks you out and decides if your sample TGP galleries are good enough to be listed on his site. What’s more, most of the big TGP sites charge you a fee just to review your galleries, with no guarantees of being listed! Don’t panic though, that can be a good thing. Cheaters and tire-kickers won’t pay to play on those sites, reducing your competition for the surfer traffic. The only thing you have to do is decide which TGP partner accounts are worth the money, if you decide to buy any at all. I have many free PAs, and I only pay for a few of them. I have to admit they do send a lot of traffic. TGP Name Submit Page Partner Account Required? The Hun Submit no. can submit every 3 days. Al4a Submit yes. apply here. can submit every other day. Free Pic Series Submit yes. apply here. Persian Kitty Submit yes. apply here. Worldsex Submit yes. apply here. can submit every other day. A good listing on The Hun or Worldsex can send well over 50,000 surfers to your gallery on the first day alone, diminishing each day as it moves down the page and finally into the archives. your TGP gallery => $! You have your TGP gallery ready to submit, but there’s a snag. Most TGP sites want a reciprocal link (aka a recip) to their sites at the top of your page in exchange for possibly listing your gallery, usually with a couple of other TGP sites you’re submitting to. This is to increase the incoming links to their site as well as possibly getting some traffic back (this is negligible don’t worry about it). This recip code is always found on the TGP site’s submit or rules page. Just copy/paste it into the html code at the top of your TGP gallery. So, you’ll take your clean TGP gallery and insert recip links for each group of three TGP sites that want recips and give it a new name. This is called a ‘mirror’ and you will submit this page to the TGP sites with these reciprocal links at the top. Repeat this for all the TGP sites you plan to submit to and you’ll end up with multiple mirror pages of your TGP gallery. Here I have created a mirror page with three recips at the top for Worldsex, Free Pic Series, and Persian Kitty. You can name it whatever you like, but I prefer to use the initials of the sponsor site followed by the TGP sites. In this case, I named this mirror copy ftvwsfpspk.htm which stands for ‘FTV Girls – Worldsex, Free Pic Series, Persian Kitty’. This is the mirror copy I would submit to those tgps. Finally, you’re ready. Upload your TGP gallery and all the mirror copies, images, thumbnails to your server. Your url to your TGP gallery will depend on the directory structure you uploaded to. Verify the url by loading it in your browser. The gallery would load fine for you after uploading to your server because your browser is loading the files from your C:/gallery directory. Of course anyone else loading your gallery would not have those images on their C:/gallery so all the image links would be broken for them. Everything work? Good! Now visit each TGP submit page and review their rules to make sure your gallery is compliant. If you’ve been following this blog you should be ok. Fill in their submit forms with your info. Roboform is a great free tool to auto-fill the forms for you. Use a valid email preferably only used for submitting galleries. Free Google, Yahoo, etc email address are generally not accepted. Try to give a unique description or thumbnail if they ask for it. ‘Hot babe gallery’ isn’t going to cut it. Describe your gallery content as best you can, review what’s already listed if you need examples. If there are no problems, your gallery is submitted for review and you’ll get a thank you type of message. Many TGP sites use an email verification process before they’ll review your gallery. Check the email you used for submitting for these messages and click on the verification link provided to show it’s a valid email. Then the gallery is in the review queue. After submitting, DO NOT change anything on the gallery. It is now ‘locked’. In the ever-present war against cheaters, the TGP sites usually have a software bot that periodically checks your TGP gallery for changes. Any changed galleries get removed, and frequent removals might lead to being banned from submitting any more if they think you’re cheating. If your server is down or some other valid reason, you’ll be ok. The TGP owners review these gallery submissions on their own time. Some review every day, some a lot longer, so your gallery may take a while to be reviewed depending on the site, especially if there’s a backlog of submissions before yours. Some sites will send you an acceptance or rejected email. TGP galleries are a ‘build and forget’ type of web page. Once it’s submitted, move on to the next one. Try not to submit the same template/sponsor/niche all the time. TGP owners want variety for their surfers so mix it up. Don’t ever reuse content there is no need, there’s a vast ocean of promotional content sponsors have for you to use, and there’s an unbelievable amount of adult affiliate programs out there. 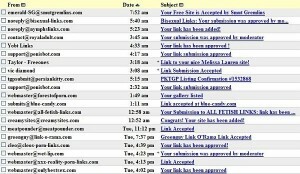 Try to submit at least one TGP gallery a day, because TGP traffic is a numbers game.